✅ Trip Verified | Beijing to San Jose. The service in the flight was perfect! The meals and snacks are delicious. I was impressed by the heated bread. On the back side of the cabin, the burger snacks and biscuits was provided whether how much the passengers had eaten. The hardware and software in the cabin were excellent. The brand new Boeing 787-9 light provided inside the cabin was comfortable. The cabin crew were very professional and friendly. Their English was very good. They had a great conversation with everyone on board. As an aviation fan, I talked about aviation and airlines with them. They told me much information about the systems of aircraft and the service of the airline. They even helped me filling the flight log I've created. Hope to fly Hainan Airlines again. "staff in China speaks no English"
✅ Trip Verified | Was a very pleasant flight though food very poor from Sydney. IFC just okay not much of a selection compared to BOAC, AF, or AA. The reason for the average score though is that this company does not transfer your bags from one of their flights to your connexion flight. You have to collect your bag in China, face a surly immigration official, pass your bag through an x-ray machine upon arrival, then drag it far away and upstairs and check-in a second time to get your connexion boarding pass and to reconsign your luggage. Also, if your connexion doesn't depart within three hours you have to cool your heels in the check-in lobby and sit with your luggage. That is a colossal inconvenience and when you're a man of my age (56) it is difficult. Also, Hainan AIrlines doesn't seem to have the right to use any of the gates at any of the Chinese terminals (or LAX for that matter) so plan on being bussed all over the airports. Another thing that is troublesome is that their staff in China speaks no English. They carry around their smartphones and show you the translations of what they want to communication ("one moment, please."). ✅ Trip Verified | Chicago to Beijing. The crew were really friendly and provided excellent service. The meals were tasty and seats were comfortable. After a meal, a Taiwanese crew helped me a lot when he passed by. When the plane was about to land, an old man next to me couldn't find his key or something and the purser, who was in charge of the economy class cabin, helped him find that. In a word, it was an excellent experience. ✅ Trip Verified | Sydney to Haikou on 4th January, returning Dalian to Sydney via Changsha on 25th January. The A330 seemed very old and the cabin dirty. 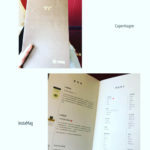 When I flew Sydney to Haikou, I was given an amenity kit but for some reason on the way back from Changsha sitting in the back I was not given one, but passengers in the front was given it. Crew did not offer headphones, I had to ask. Customer service was great from their staff however I did feel that they were rushed. Transfer experience was awful. I had a transfer from Dalian to Sydney at Changsha with an 8 hour gap but I had to take my luggage and recheck in Changsha. ✅ Trip Verified | Shenzhen to Beijing. It was a new Boeing 787-9 with seating 1-2-1 which gave ample room and privacy. 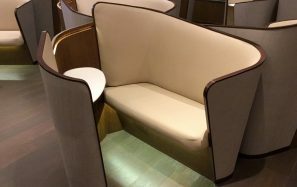 The seat could converted into a flat bed which is rare to find in any domestic flights. Three course dinner was served with good choice of red and white. The hostesses worked hard to get their job done as it was a two and half hour flight, yet polite and attentive. ✅ Trip Verified | Shenzhen to Vienna. The lounge that Hainan Airlines use in Shenzhen (it's not their own lounge), but you should not arrive hungry or thirsty, because this lounge can only be called a bad joke: no food, no spirits, no white wine, just some beers and a very poor red wine, soft drinks, instant noodles, that's it. Thankfully, the fun started as soon as we entered the plane. We were immediately offered a welcome drink (including a choice of Champagne) and were warm-heartedly taken care of, with help in stowing our belongings etc. This went on for the entire flight. 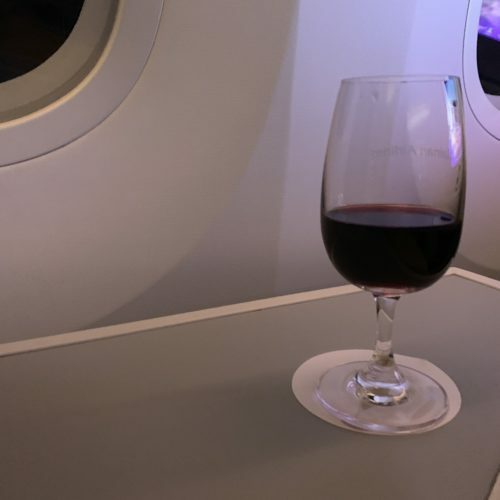 Super-friendly and competent crew, delicious food, great inflight entertainment and a full range of drinks, from a choice of 3 red wines to even Cognac and other spirits if you wish. The choices of dinner and breakfast were amazing, nicely presented and very fresh and tasty. 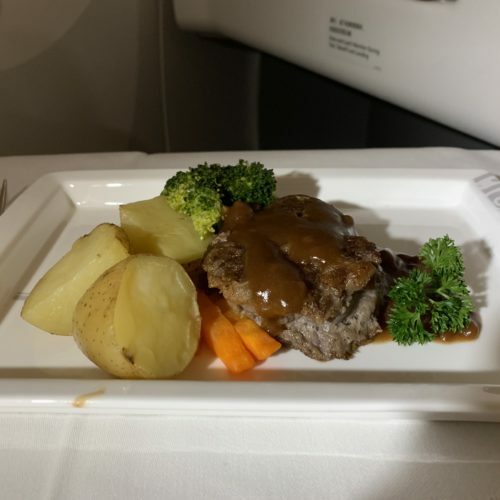 We very positively surprised of everything, from the cabin (a new Boeing 787 with 1-2-1 layout and full flat seats), through the flight attendants to the cook, who came even personally to you in order to confirm that the food was to our expectations. It was, actually, beyond our expectations. We fly a lot and have been on a lot of airlines, but this was certainly one of the nicest experiences we had (if you ignore the poor lounge-performance). Highly recommended! ✅ Trip Verified | Beijing to Calgary. 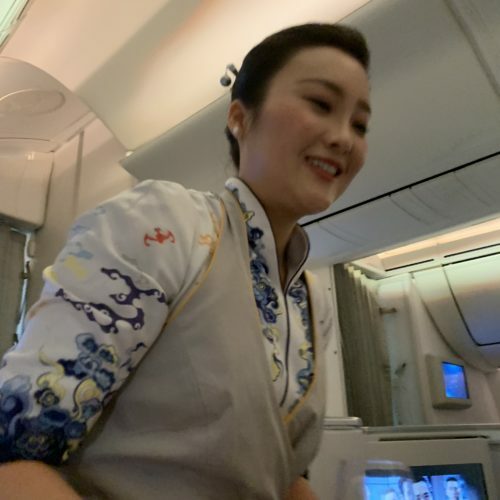 I was having a fever when I was taking the flight HU7977, the Cabin Manager and the Purser were very professional and provided the best services they could to ensure the resting environment was comfortable for me since I felt so uncomfortable. ✅ Trip Verified | Beijing to Boston, as an international student, flight comfort and ticket price are primary for me, and Hainan Airline achieved my standard. Great food and drink, 2 mean meals and free light meal between these with snacks. The cabin crew service is professional. 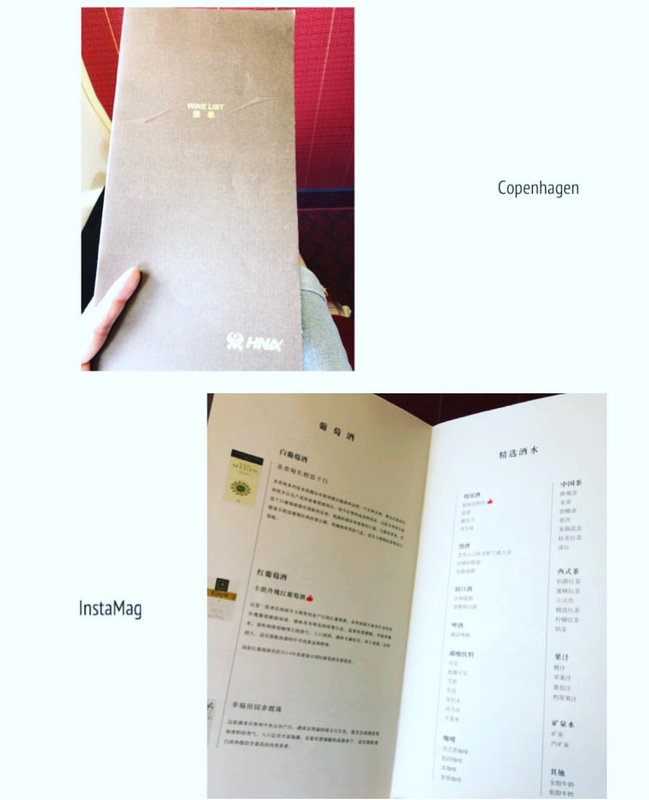 I recommend Hainan Airlines. ✅ Trip Verified | Sydney to Shanghai via Changsha. 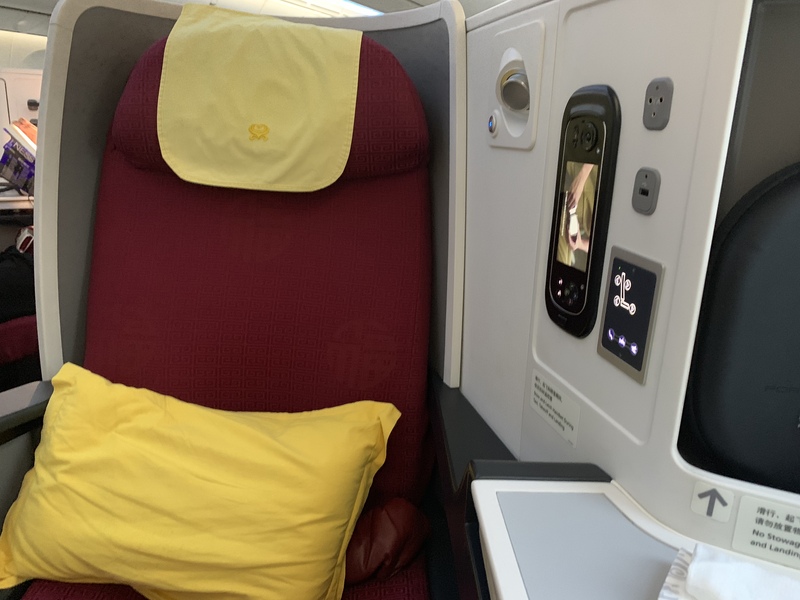 Hainan Airlines provided the most enjoyable experience I have had in the economy last year in this route, surpassed Qantas and Cathay in my opinion. The cabins were clean, the services were exceptional. The cabin crews genuinely cared about your well being. I qualified for Hainan's gold membership after a few business class flights last year. I'm also a Qantas one world gold member. Hainan provided far better recognition to their frequent flyers than Qantas and Cathay. ✅ Trip Verified | Brisbane to Shenzhen on 3rd January. 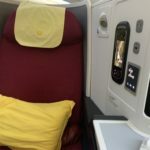 First time flying with Hainan Airlines with much disappointment. I paid extras for the preferred Economy seats but I need to change as there is no point for speaker to be plug into when viewing movies. When I brought up, an attendant recommended me to watch mute movies. I asked another attendant mentioned about changing seats but the screen does not work at the new seats. I was told if I need to watch any movies, I will have to make do by watching from the screen beside me. Such helpful advice! A male attendant tried fixing the screen but was unsuccessful. But I must admit that he did try calming me down. 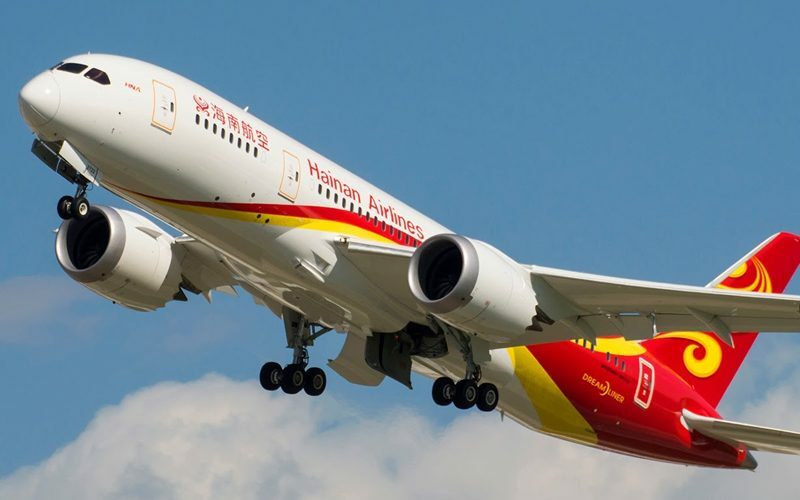 Hainan Airlines is a privately owned airline, the fourth largest carrier in China. Celebrating its 24th anniversary in 2017, Hainan Airlines is the only Chinese mainland carrier to be ranked as a 5-Star Airline. The main international hub is Beijing Airport, other hubs at Chengdu, Chingqing, Changsha, Xi'an and Shangai. 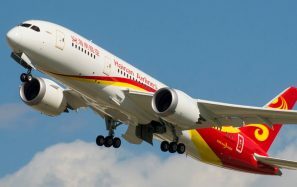 Hainan Airlines has a fleet of over 180 aircraft, including Boeing 787-9 / 787-8 / 767-300 / 737-800, A330-200/300, anda further 75 aircraft on order. 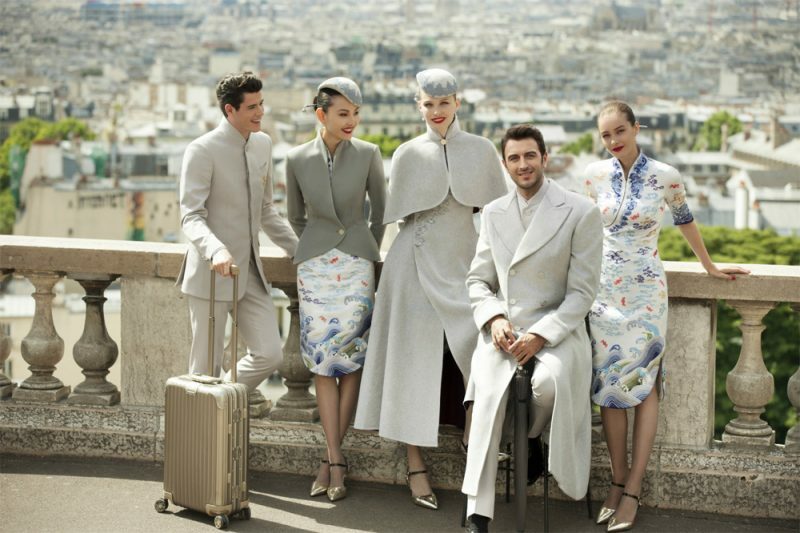 Hainan Airlines unveiled their new uniforms at Paris Couture Week in June 2017. The fifth-generation Hainan Airlines uniforms highlight the combination of traditional Chinese features and internationally popular elements. The fusion of traditional Chinese elements and popular international fashion created an Oriental masterpiece that turned heads in Paris. 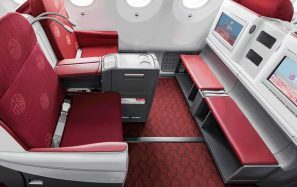 Hainan Airlines long haul business class is provided on Boeing 787 and A330 aircraft, with flat bed seats, arranged 1x2x1 and 2x2x2 subject to aircraft type. In addition to luxury amenities, business class service includes an Onboard Chef and full dine on demand. Domestic first class is provided using a mixture of widebody A330, Boeing 787 and Boeing 737-800 aircraft. Hainan Airlines long haul economy class uses Boeing 787, A330 and Boeing 767 aircraft, and also includes Boeing 737-800 on domestic routes. 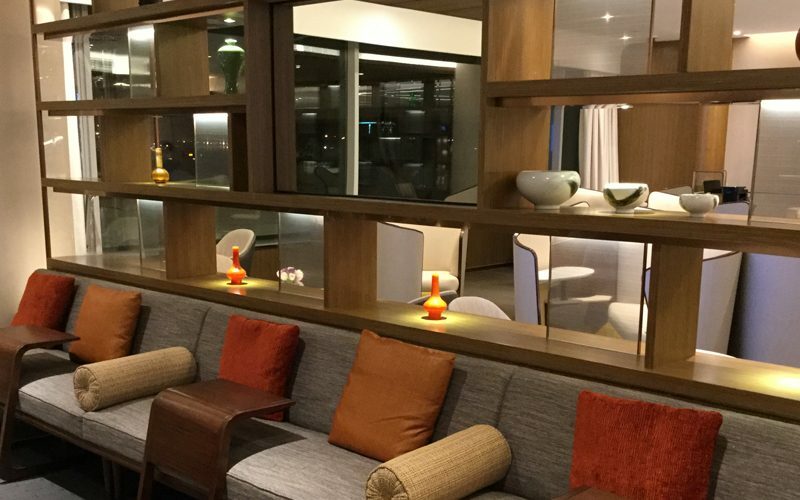 Hainan Airlines have recently opened their flagship international lounge, the HNA Club at Terminal 2, Beijing Capital Airport. 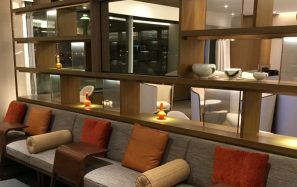 They also offer domestic lounges at many airports across China and have a new International lounge opening in Xi'an during 2017.